All day and night on February 2, the buttress of the regime - its supporters, on the one hand, and its opponents, on the other - enthusiastically fought each other on the streets adjacent to Al Tahrir Square in Cairo. Security forces from both parties were actively involved, as nearly all the participants and reporters in the crowds witnessed. One could have expected huge bloodshed from the enthusiasm of the fighters. By midnight, however, reports came in of only one citizen killed. People from all over the world watched the clashes live on TV thanks to several cameras providently set up on a nearby hotel. Since an RT observer had been watching the developments of the standoff, by the evening the scheme of transforming the peaceful protest into clashes became clear. 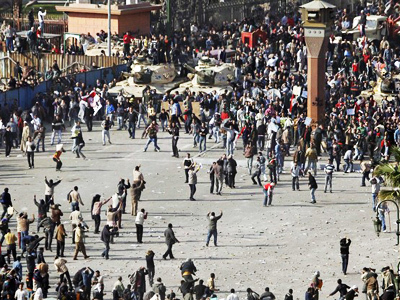 In the morning rumors circulated that despite the army urging the people to break up, 2 million had gathered on Al Tahrir Square. 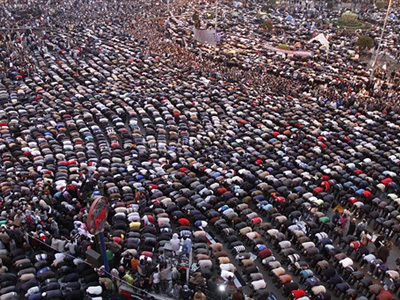 It was also reported that Mubarak’s supporters had been brought to Cairo from provincial areas – they gathered on El Mohandesin Square and began penetrating Al Tahrir. People from the opposition filled the streets adjacent to the square. Many women and families with children, students seeing my camera, would approach me and say they were outraged with the authorities they thought had deliberately provoked the bloodshed. “I never attend street protests, but came here because I am outraged with the unscrupulousness of the authorities. 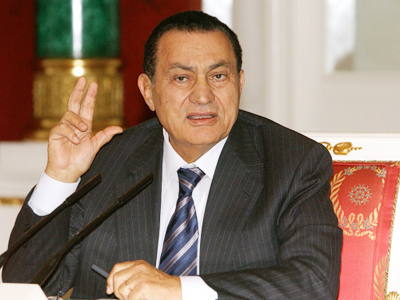 Mubarak promised to correct his mistakes while his men have fetched criminals to the square. Just have a look at their faces,” the woman said. 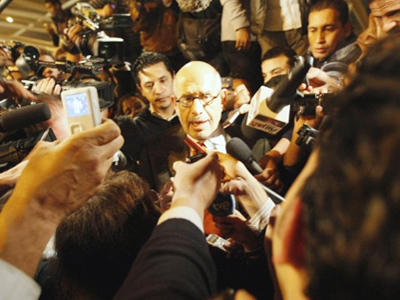 The supporters and the opponents of Mubarak shook their hands at each other and screamed one after another, “Mubarak is our president!” and “Mubarak, get lost!” Clashes would start, but the instigators were taken away. For some reason, people began to form a human chain. I came there from Al Tahrir Embankment, going through groups of Mubarak supporters, and saw those people were obviously not ready to go and try to break the human chains. However, several people from either side obviously tried to aggravate the situation. In the meantime, the number of supporters grew fast. 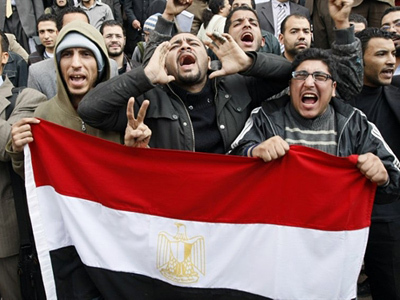 All of a sudden there appeared many men who were actively calling on others to come into the streets from Al Tahrir Square, trying to convince the people that Mubarak’s supporters were allegedly starting an onslaught from the other side. People from the other side began to throw stones. For a short while, the opposition would not react, but the provocateurs were too many and soon stones were being thrown from both sides. About every five minutes a new casualty was taken away – either carried or driven. As the violence mounted, more and more people began to threaten me and urged me to stop filming. Several individuals came up and showed a certificate they had found on the ground after they had shoved Mubarak’s supporters off. The card read that its owner was allowed to enter Cairo with horses. “The authorities hired poor people from rural areas for money and made them arrive on horses and camels and stand along Mubarak’s supporters,” the person who found the document explained to me, on record. In the morning I could see with my own eyes a whole flock [of camels] with cameleers on the embankment. They were moving to the most fashionable area of Cairo. As I was filming the scene, one person who was standing by my side began to make a phone call, and another person demanded that I stopped filming. The one who was speaking on the phone told me suddenly that indeed Mubarak’s supporters had horses and camels. I moved deeper into the street along the Archaeological Museum toward the Hilton [Hotel]. Sometimes I had to wait until the mutual stone throwing stopped. Many people enthusiastically hollowed out the pavement, took the pebbles and wrapped them up into flags. I encountered six or seven tanks captured, with no soldiers or officers in them. However, the captors did not make attempts to start the tanks and drive them anywhere. The protesters also captured several armored-personnel carriers and army trucks and simply made use of them as pads to monitor the battle field. At that moment the opposition was apparently driving Mubarak’s supporters off, although none of the fighters could explain any sense in these clashes. Then they began to persistently push me toward the tanks. When I was filming the talks between [representatives of] the people and the army standing beyond the fence of the Archaeological Museum, some people began to seize my arms and push me until I was handed over to people in uniform who seemed to have been too well fed for regular army officers. Unlike the Egyptian officers, they not only grabbed my arms but also reviled me in the nastiest manner, cursing in fairly good English. Later I learned that it was exactly in this way that most cameramen and photographers had been removed from the square. The pictures taken by some, like a French correspondent, were erased. A Belgian citizen and two crews from Russia were detained. A Russian correspondent was taken for an American and was detained, too. 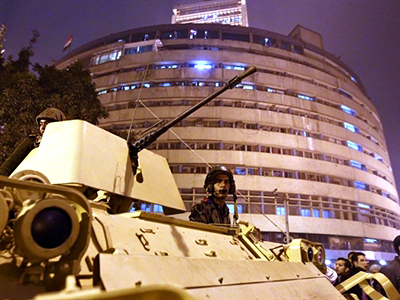 All was done exclusively by people in civilian dress, [obviously] Mubarak’s supporters. My attempt to return to the square failed. Each time I ended up in a crowd of very aggressive young men very much looking like criminals. I could clearly see among them those who were in charge and commanded to throw stones and to retreat. By dusk, police vehicles equipped with flashers appeared. They kept afar, so as to avoid being hit by the stones thrown. At about 8pm the first gunshots were heard. So far it’s been understood that the shots were only fired into the air. The crowd began to throw Molotov cocktails. Meanwhile, scenes of cruel and senseless clashes continued to be broadcast from two locations. I managed to get quite close to one of them. The people were banging sheets of steel and throwing stones, without causing harm to each other. I did not notice any Muslim Brotherhood members among the stone throwers. They had been quite noticeable on the square during protests, they apparently kept themselves aloof from this senseless occupation.The stone throwing process continued up until midnight. 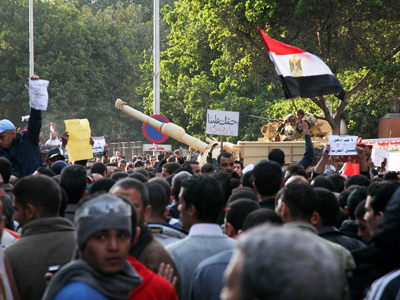 On February 2, the Mubarak regime apparently tried to show that it had supporters. From as high as the 10th floor, where the TV cameras were set up, the difference between the supporters and the opponents of the regime was hardly discernable. Is it really so, and will the rest of the world agree?